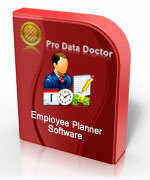 Schedule and manage multiple company employee’s records and payroll details in significant way. Avoid scheduling conflicts when assigning work shifts to employees. Easily manage employee attendance records. Easily manage staff leave and other details. Manage employee tour and training records going for such events. View and print useful company reports and employee reports to analyze overall performance. Software creates and maintains multiple company employee records and payroll details at one place. Software is password protected and secure company records from external users. Administrator can assign limited rights and accessibility to access software modules for Power user and General users in case of non-availability. Data Connectivity is an important feature to connect selected company database records to view and edit its information. Software facilitates to take data backup so that it will be preserved in case of failure, accidental deletion or other data loss events.